I recently ran a workshop at the SOCANZ Auckland Innovation Conference titled Design Practice for Innovation:. The focusing question for the workshop was: How can we use creative design approaches to co-create value? Max Adler of Imminent Service Design helped facilitate the session (thanks Max!) and we with worked with 30 fabulous participants from a range of community and social sector organisations from across New Zealand. Design is an action-based practice and best explored through experiential rather than theoretical means. In this vein the workshop was hands-on and included two ‘Design Doing’ activities (User Journey Mapping & Prototyping). These activities enabled participants to reflect on some of the core principles and practices of design – as well as how they might be applied in their own context – on the basis of (a little!) hands-on experience. The discussion of the design process was structured around the UK Council’s Double Diamond process (see image below) which is useful for demonstrating how design is as much about framing as it is ‘solutioning’. I’ve shared the key summary points, the slides from the workshop (minus project examples) as well as the next steps reference list that participants received as a handout below. In terms of thinking about how we involve and work with the people we serve during the design process, I find it useful to think in terms of the questions that we are asking at the various stages of the design process. Our focus then becomes how we can work together with our users, clients or constituents to discover the answers. For the purposes of this workshop the questions were framed in relation to the two halves of the double diamond. (See yellow bits in the session summary above). 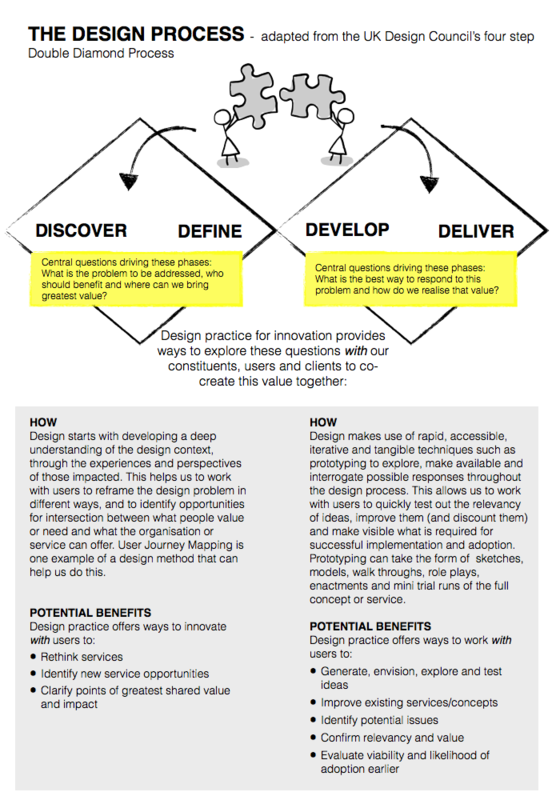 A more detailed breakdown of the different questions that we might work with users to explore as we move through the different phases of design ourselves is included in slide 22 of the deck above. PDF version of the workshop take outs. 90 minutes is only enough to just start scratching the surface but there are many resources available for those looking to learn more. The What’s Next links below provided some start points for participants keen to follow up. Big thanks to all the wonderful participants who joined us for the session. I look forward to other opportunities to continue the conversation and hear more about where different organisations in NZ are at in terms of leveraging design to support their innovation process. A number of free toolkits (below) have been developed to support organisations and public services to adopt co-design approaches and apply design practices for social impact and innovation. For people already using similar approaches, the following toolkits and links may provide a resource for extending engagement into the design process. For others these links provide a start point for learning more about the different design methods as well as how they are being applied in a range of global contexts. Bate P, Robert G. Experience-based design: from redesigning the system around the patient to co-designing services with the patient. Qual Saf Health Care. 2006;15:307–310.